1. How Big Is Your Baby? By this week, baby weighs almost 1 pound (455g)! Its crown-to-rump length is 8 inches (20cm). Your baby is about the size of a small doll. Your uterus extends about 1½ inches (3.75cm) above your bellybutton or about 9¼ inches (23cm) from the pubic symphysis. Your total weight gain should be between 12 and 15 pounds (5.5 and 6.8kg). Baby’s body is getting plumper but skin is still wrinkled. Lanugo hair on the body occasionally turns darker at this time. 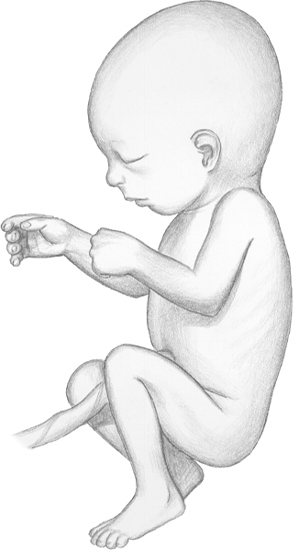 The baby’s face and body begin to assume more of the appearance of an infant at birth. Your baby’s pancreas is important in insulin production. Insulin is necessary for the body to break down and to use sugar. When the fetus is exposed to high blood-sugar levels from the mother-to-be, its pancreas responds by increasing the blood-insulin level. Insulin has been identified in a fetal pancreas as early as 9 weeks of pregnancy and in fetal blood as early as 12 weeks. Blood-insulin levels are generally high in babies born to diabetic mothers. This is one reason your healthcare provider may monitor you for development of gestational diabetes. Twin-to-twin transfusion syndrome (TTTS) occurs only in identical twins who share the same placenta. The syndrome is also called chronic intertwin transfusion syndrome. The condition can range from mild to severe and can occur at any point during pregnancy, even at birth. Are you also having pregnancy symptoms? Studies show as many as 50% of all fathers-to-be experience physical symptoms of pregnancy when their partner is pregnant. Couvade, a French term meaning “to hatch,” is used to describe the condition in a man. Symptoms for an expectant father may include nausea, weight gain and cravings for certain foods. TTTS cannot be prevented; it’s not a genetic disorder nor a hereditary condition. We believe it occurs in 5 to 10% of all identical-twin pregnancies. TTTS occurs when twins share a placenta. These problems do not occur in twins who each have a placenta. The other twin grows large, overloaded with blood. It produces excessive amounts of urine so it is surrounded by a large volume of amniotic fluid. Because the recipient twin has more blood, it urinates more and has more amniotic fluid. Its blood becomes thick and difficult to pump through its body; this can result in heart failure. The twins are often very different in size. There can also be a large difference in their weights. TTTS is a progressive disorder, so early treatment may prevent complications. and eyebrows are well developed. The syndrome may also be detected with ultrasound examination of the uterus. It’s important to find out whether twins share the same placenta, preferably in the first trimester because in the second trimester it can be harder to learn whether they share one placenta. If the syndrome is mild or undetected on ultrasound, the appearance of the twins at birth may identify it. A complete blood cell count done after birth will show anemia in one twin and excess red blood cells in the other. If diagnosed, the Twin to Twin Transfusion Syndrome Foundation recommends weekly ultrasounds after 16 weeks till the end of the pregnancy to monitor TTTS. They recommend this be done even if the warning signs of TTTS have decreased. The most common treatment for TTTS is amnioreduction, in which large volumes of amniotic fluid are drained from the sac of the larger twin. A needle is placed through the mother’s abdomen, and fluid is drained. The procedure is repeated, if necessary. With the laser treatment, a detailed ultrasound exam is done first to help locate the abnormal connection. Then a thin fiber-optic scope is placed through the mother’s abdomen, through the wall of the uterus and into the amniotic cavity of the larger twin. By looking directly at the placenta, blood connections can be found and sealed by directing a laser beam at them. This separates the circulation of the fetuses and ends twin-to-twin transfusion. However, this requires doing the procedure while the babies are still in the womb and may cause serious complications. The most conservative treatment is to watch and to wait. The pregnancy is followed closely with frequent ultrasound examinations, with the choice of delivering the twins by Cesarean delivery if medically necessary. Newborns with twin-to-twin transfusion syndrome may be critically ill at birth and require treatment in a neonatal intensive care unit. The smaller twin is treated for anemia, and the larger twin is treated for excess red blood cells and jaundice. - Pregnancy Week by Week : Week 22 (part 1) - What Is Anemia?